The bison’s hollow hair allows for a supreme level of insulation, as a sleeping bison will have falling snow collect atop its back. A bison loves the cold, a superior winter forager whose hooves are like shovels, getting at the frozen, green grass below the snow. The bison once overran the plains of Montana, but cattle now far outnumber them. Nonetheless, ranchers have been raising the wild animal for a variety of reasons, namely of which is profit. Ground bison is over twice the price of ground beef. And with nationwide bison sales up a staggering 17% this past year, some ranchers are switching to the cow’s hairy cousin. Advertised as the healthy alternative to beef, suppliers can’t keep up with the demand. More of the good and less of the bad; more minerals and more iron, but less fat and cholesterol. Ultimately, the taste test is all on you! Bison ranching is not cattle ranching. Bison are smaller—half the size of their bovine cousins—yet they are much more rowdy. A docile cow will flee from a prod to their backside, while a bison will quickly turnabout, defending with sharp horns. Bison can reach speeds of 40 miles per hour and can jump over 5 feet from a stand still. Annoyed cows turn away from barbed wire, while bison are liable to blast through most fencing. Seven-foot reinforced fencing is recommended; however, past the initial fence investment, bison are more self-sustaining. Their winter resilience equates to fewer winter feedings and fewer immunizations. Yet, the greatest cost savings lie in not needing to build a barn; the bison cows can handle calving all on their own. The rancher shows up less often and is rewarded with new stock. The prairie ecosystem benefits by the return of the bison. Given ample space, the moving bison herd won’t overgraze the grass, allowing the pasture to recover. Cows won’t eat the beautiful, yet stalky and sharp yucca plant, but it’s a popular winter snack for bison, clearing the range for more edible grasses. Bison don’t need privacy as they wallow in the dirt, giving themselves a dust bath. It’s fun to watch them dust off, and these bison wallows become small, springtime waterholes. Grasses circling them are taller and healthier, while toads and salamanders use the small new waterholes for homes. A major issue for Montana cattle ranchers is to ensure the bison herds are brucellosis-free. All domestic Montana bison herds are. 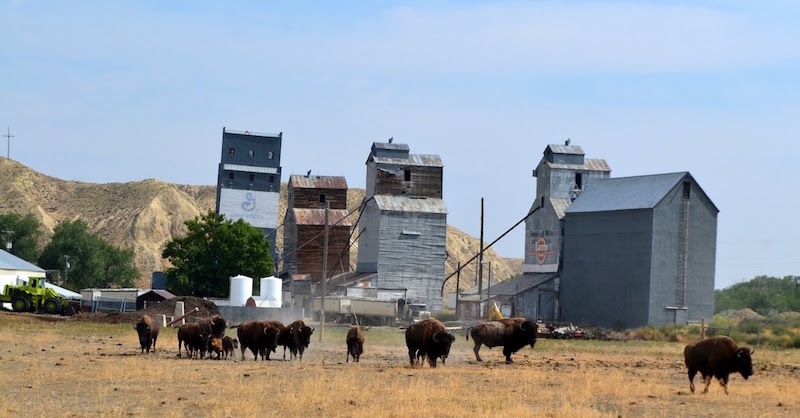 After health and safety, if bison ranches lead to more Montana-made products, more jobs, and an added bonus of something great to eat, bison production will continue to benefit Montana.